The Chicago Fire: Was Your Ancestor Insured? My husband's ancestor, James Ayer Smith, arrived in Chicago in the spring of 1835 with plans to open a hat and cap store, and in August of that year, his father sent him a letter with some very detailed advice on how to succeed. In closing, he wrote, "There has been a heavy fire at Cleveland & I hope you will not fail to have insurance made on your stock immediately to the full amount Your affectionate Father Chas. Smith." James appears to have taken that advice. When he lost business property in a fire in 1857, he received a $3000 settlement, with payments shared by six insurance companies. And in 1871, when The Chicago Fire hit, he was once again well insured. 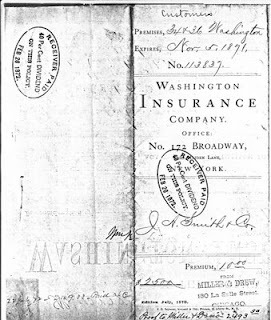 For example, James A. Smith & Co. had a policy from Washington Insurance Company purchased in August, 1871 in force through November of the same year "against loss or damage by fire ... on Furs manufactured or unmanufactured, also on Wearing Apparel manufactured in whole or in part of Furs or manufactured entirely of any other materials, Fur and Buffalo Robes and Lap Blankets left with them for safe keeping and for the deliver of which to the owners, they have made themselves responsible, loss or no loss, contained in the fourth story of the four story brick building with stone front known as Nos 34 and 36 Washington Street Chicago Illn." The policy was sold by Miller & Drew on La Salle in Chicago and the $10.00 premium provided $2500.00 worth of coverage. Based on a list of policies held, goods covered, and settlement amounts, James appears to have had at least twenty-eight policies in effect at the time of the fire. But what about your ancestor? Was he or she insured? Because extensive damage meant an unusually high number of claims, many insurance companies filed for bankruptcy and court documents related to these proceedings include lists of creditors--people with claims. And the list goes on--three pages, four columns each, with tiny type. And that's just one insurance company. 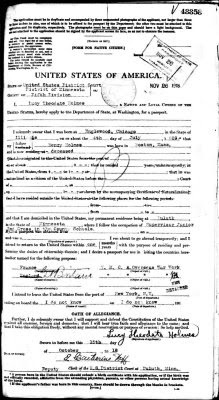 There are similar documents for many other companies included in the James A. Smith papers. Unfortunately, the names on the lists aren't alphabetical. 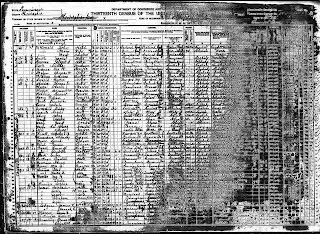 It would take some time to search for a particular name, and if the name was common, "Patrick Murphy," for example, it would be hard to determine whether or not the person listed was actually an ancestor. But if you are researching a unique name, it might be worth taking a look. 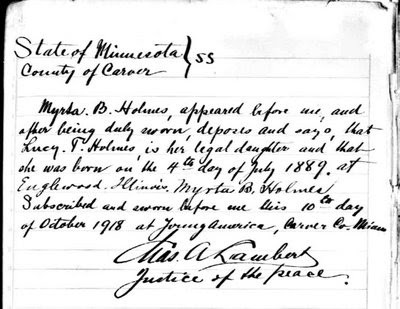 Lists of creditors are available from documents included in the James A. Smith papers, held by the Minnesota Historical Society, but they may also be available from the courts which handled the bankruptcy proceedings. 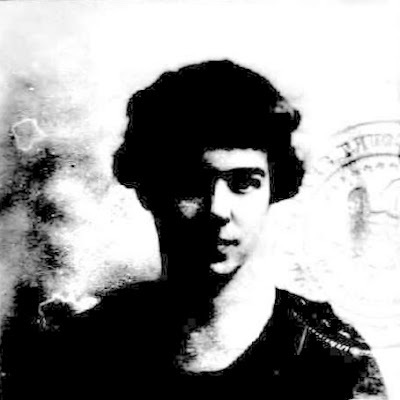 Two of those mentioned in the James A. Smith documents include the District Court, Northern District of Illinois, and the District Court, Northern District of New York. 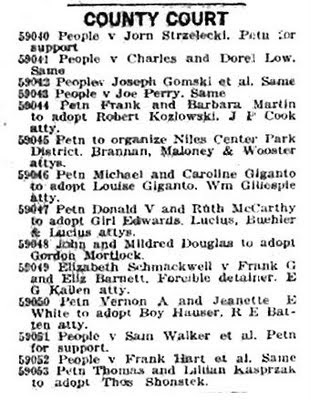 Gleanings from "Legal Friend of the People"
In January, 1911, the Chicago Daily Tribune began publishing a column called “Legal Friend of the People.” Readers wrote in to ask questions about legal matters and topics ranged from what to do about a neighbor’s bothersome ducks to marriage, probate, and citizenship. 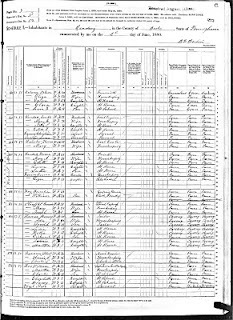 For genealogists, this column is a rich source of information about the laws of the times. 4 Mar 1912, p. 8: The legal age of a woman is 18; legal age of a man is 21. 28 Mar 1912, p. 10: Nevada laws permit remarriage within months of a divorce; marriage there under those circumstances would be considered legal in all other states. I'm not sure I'm the best one to point this out. After all, I earn extra income by looking up Chicago birth, marriage, and death records for researchers for a small fee. But, on the other hand, one of my goals is to educate researchers on which Chicago and Cook County records can be found where, and I think this falls under that umbrella. So, here goes . . . 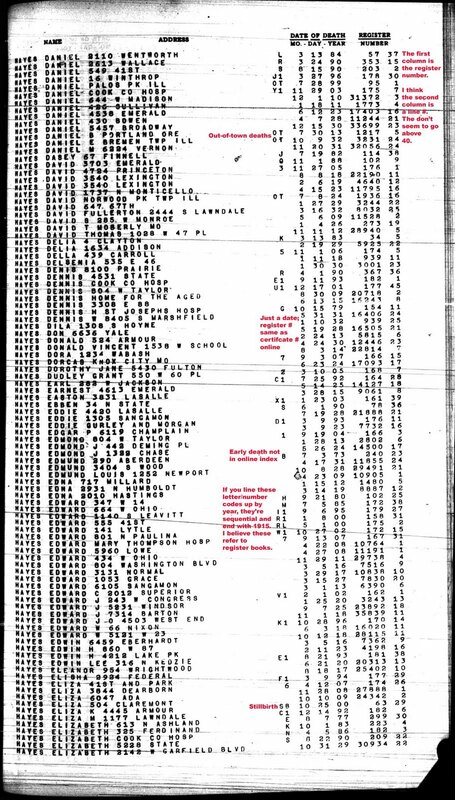 I was just searching Ancestry.com, hoping to stumble on some information about a person I'm researching, and I ended up in the Cook County Death Index, 1908-1988. It's a handy resource, but I think one small tweak needs to be made to the results page. 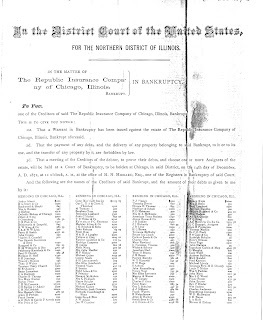 When I rolled over the "Purchase from Cook County" link, the pop-up read "Indexes have been made available here at Ancestry, however, images and original certificates are only available through the Cook County Clerk's office" and the word "only" isn't quite right. 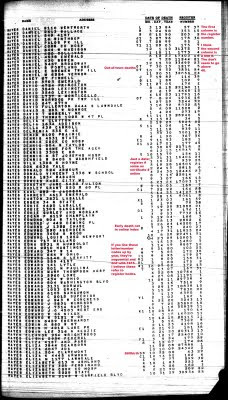 Chicago and Cook County death records up through 1947 are available both in Springfield and on microfilm that can be viewed at or borrowed from the Family History Library in Salt Lake. And, in the Chicago area, they're available at the Wilmette Family History Center. It's likely that the word "only" is there because it's much easier to phrase it that way than it is to try to explain that some records are available from a number of repositories while others are only available from the clerk's office, but it would be better to just leave the "only" out. 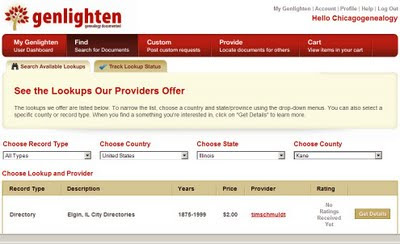 Most people would just click through and purchase the records from www.cookcountygenealogy.com anyway. 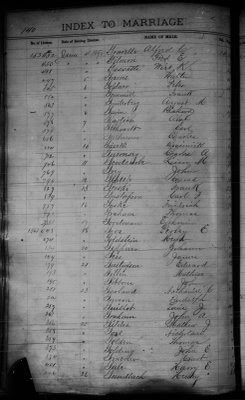 I applaud Ancestry and the Cook County Clerk's Office, by the way, for teaming up to make this index and the corresponding records easily available to researchers. I really do. Sometimes people ask me, "Can you get records after 1947? and sometimes they mutter, just a tiny bit, when they find out that I can't, and that they will have to pay $15 for whatever they need. My reply? 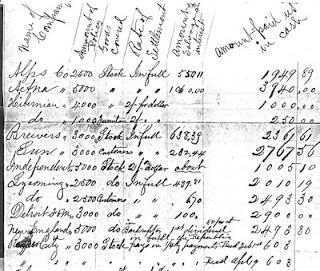 It costs money to preserve valuable records and to build applications like the new Cook County vital records website and $15 is money well spent if you need a record to keep your research moving forward.